December courses begin officially on November 12, the focus weekend takes place December 8-9, and final assignments are due January 11. Christian Ethics is a field of study in which theological reflection is employed to develop a normative account of the moral life of Christians. This course acquaints students with Christian Ethics as a theological discipline and field of study, provides tools to articulate an account of the Christian moral life, and considers the relationship between theology and the practice of ethics in the life of the Church. Bader-Sate, Scott. Formed by Love (Church’s Teaching Series for a Changing World). Church Publishing, 2017. Blackburn, Simon. Being Good: A Short Introduction to Ethics. (Second Edition) Oxford University Press, 2003. Moore, Kathleen Dean, and Nelson, Michael P. Ed. Moral Ground: Ethical Action for a Planet in Peril. San Antonio: Trinity University Press, 2010. The Venerable Betsy Bennett taught philosophy at Hastings College for sixteen years, and has been an Episcopal deacon since 2004. She currently serves as Archdeacon for the Diocese of Nebraska. The focus of her diaconal ministry is religious environmental work, which includes writing the Green Sprouts blog. A 2008 GreenFaith Fellow, she has been active in several religious environmental organizations as well as the Association for Episcopal Deacons and Spiritual Directors International. Her M.A. in philosophy is from The Ohio State University. 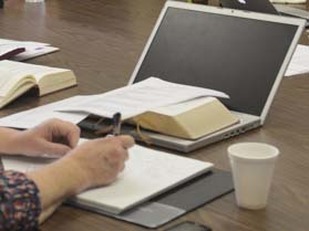 This course is intended for those on the path toward ordination to the diaconate in order to help you to develop an understanding of the diaconate in the Church, in general, and the Episcopal Church, in particular. Specifically, this course examines the history, evolution and theology of the diaconate from the time of the first-century church to the present. The class also emphasizes the study of the permanent or vocational diaconate, especially the form and manner in which diaconal ministry is performed in the Episcopal Church and the world. Collins, John N. Diakonia: Re-interpreting the Ancient Sources. New York: Oxford University Press, 2009. Plater, Ormonde. Many Servants: an Introduction to Deacons, Rev. Ed. Cambridge: Cowley, 2004. Plater, Ormonde. Deacons in the Liturgy, 2nd Ed. New York: Church Publishing, 2009. Watson-Epting. Unexpected Consequences: The Diaconate Renewed. New York: Morehouse Publishing, 2015. The Venerable Dr. Charles Pearce was ordained to the diaconate in 2000 and was appointed Archdeacon for the Episcopal Diocese of Kansas by Bishop Wolfe in 2007. He serves as Archdeacon of the western half of the diocese and as Archdeacon for Diaconal Formation and Education. Pearce is an emeritus professor of mass communication at Kansas State University, retiring in 2012. In addition to being Archdeacon, Charles is assigned as deacon at Saint Paul’s, Manhattan. He is a 1999 graduate of the Kansas School of Ministry. Brown, Rosalind and Christopher Cocksworth, On Being a Priest Today . Cowley, 2002. Ramsey, Michael, The Christian Priest Today, New Revised Edition. Cowley, 1985. This course will explore biblical, historical and contemporary interpretations of the person and work of Christ.